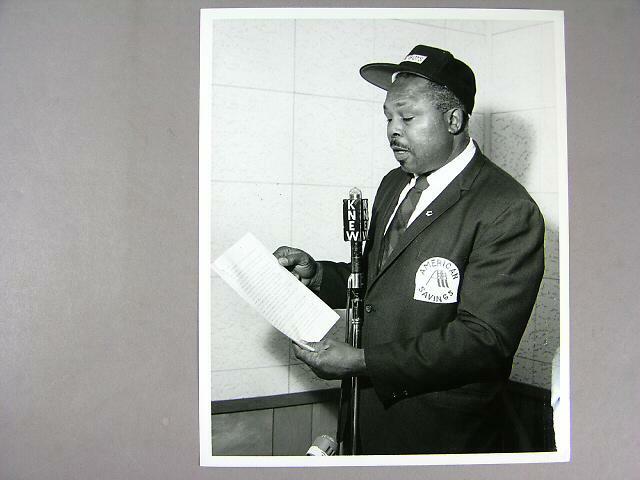 Black and white photograph of former light-heavyweight boxing champion Archie Moore speaking in front of a microphone. Moore is wearing a white collared shirt with a dark suit jacket and tie and a baseball cap. A patch on his jacket reads "AMERICAN / SAVINGS." He is holding a paper from which is reading in front of him. The microphone is labeled "KNEW." Archie MooreFrom Wikipedia, the free encyclopedia: http://en.wikipedia.org/wiki/Archie_Moore (8/17/2007)Archie Moore whose birth name was Archibald Wright (December 13, 1913 _ December 9, 1998) was a light heavyweight world boxing champion. A native of Benoit, Mississippi, raised in St. Louis, Mo., he died four days short of his 85th (or 82nd) birthday, in his adopted home of San Diego, California. He was also a social figure, and a man who became involved in African American causes once his days as a fighter were finally over. His nickname was "The Old Mongoose." He holds the record for the most knockouts by any boxer, at 145.